Both founding partners have gained great experience from their previous major domestic and international transactions connected with their clients‘ portfolios, which enabled them to establish perspective, fast-progressing and investor-oriented law firm dealing in addition to general legal practice in the areas of private and public law as well with some specialised areas such as implementation of tax and creation and founding of legally effective corporate structures, asset management of private property, protecting and representing interests of investors when investing abroad, comprehensive legal services in the areas of public procurement and representation at court proceedings or enforcement of claims. The law firm offers its legal services in its headquarters located in Prague, in Atrium Flora. In order to provide high-quality services the law firm is composed of thirty five-members consisting of attorneys-at-law, trainee lawyers, legal assistants and administrative staff. The capital of the company was provided by both founding partners in the amount of CZK 46.500.000. In the year 2013 the law firm welcomed its third partner, Mgr. Petr Sedlatý, who joined the existing two founders. Mgr. Lukáš Sedlatý withdrew from the law firm as a shareholder in year 2015, but he is still cooperating as a substitute Attorney-at-Law. The law firm is covered by insurance up to the amount of CZK 100.000.000 for all Europe. The law firm Advokátní kancelář Brož, Sedlatý s.r.o. 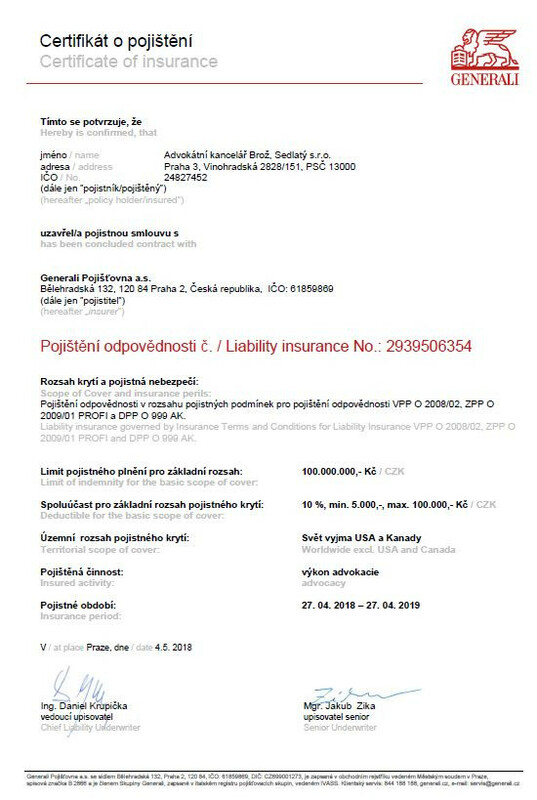 is insured with GENERALI a.s. corporation up to the amount of CZK 100.000.000 for the services provided in Europe. 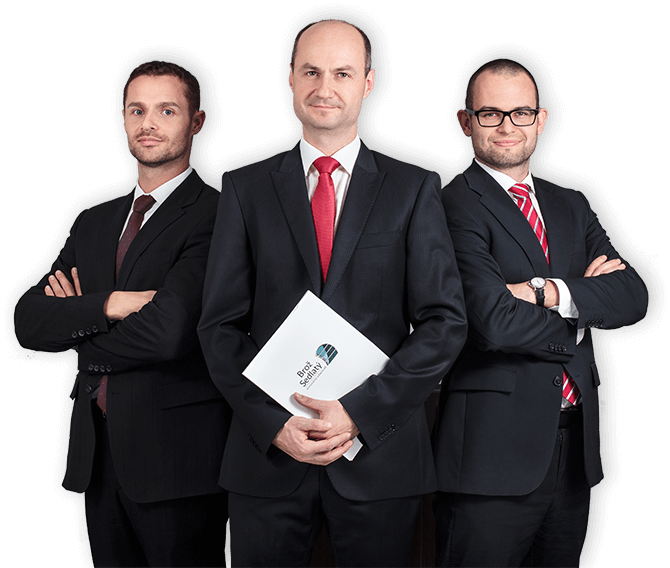 The law firm Advokátní kancelář Brož, Sedlatý s.r.o. 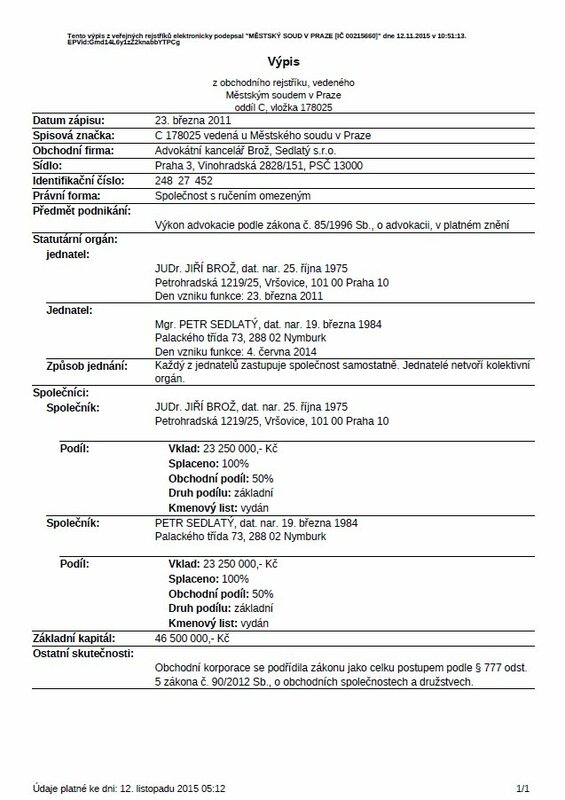 is registered in the commercial register and maintained by the Municipal Court in Prague, section C, insert no. 178025 and has two members. Each from the three directors is entitled to act independently. The capital of the company is CZK 46.500.000 and is fully repaid. The company was registered in the register on March 23, 2011. All attorneys-at-law, including trainee lawyers, working in the law firm Advokátní kancelář Brož, Sedlatý s.r.o. are registered in the relevant list maintained by the Czech Bar Association. The law firm Advokátní kancelář Brož, Sedlatý s.r.o. declares that within its activities it complies strictly, categorically and unconditionally with all rules of professional ethics and competition of attorneys-at-law. Advokátní kancelář Brož, Sedlatý s.r.o. always processes personal data responsibly and fully in accordance with the respective legal regulations. In accordance with the requirement for transparency, we make the following declaration of personal data processing and protection. In case any consumer dispute occurs between the law firm and the client as a consumer, whereas a consumer is deemed to be any individual who acts outside its trade, business or profession, the consumer has the right, under the the Act No. 634/1992 Coll., on Consumer Protection, as amended, to its alternative dispute resolution. The authorized ADR entity for alternative dispute resolution for consumer disputes between an attorney-at-law and a consumer is the Czech Bar Association (CAB). ADR is free of charge and each party shall bear its own costs. A proposal for ADR must be filed by the consumer not later than one (1) year after the day when the consumer made his/her claim towards the attorney-at-law for the first time. Terms of the proposal including the application form and related information are available on the web of CAB: http://www.cak.cz/scripts/detail.php?id=15607.